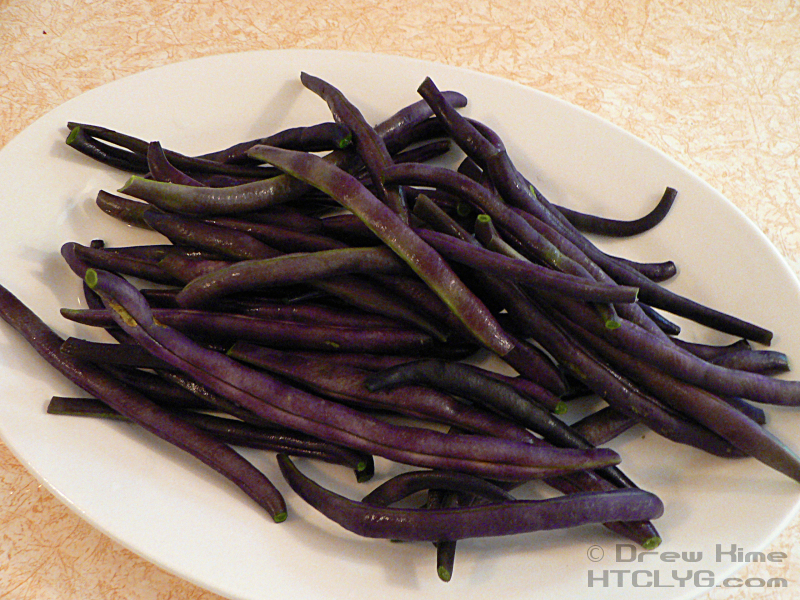 I’d never had purple beans before. I saw them at the farmers market where a friend of mine was buying some. 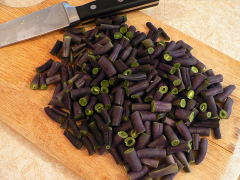 I asked and she told me that they taste just like green beans, and in fact turn the same color green when you cook them. Well what would be the point of that? 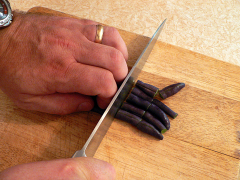 So I knew I needed to get some, and I knew I couldn’t cook them. 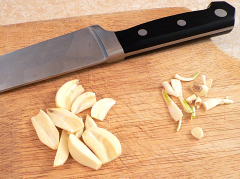 I decided this would be a perfect time to use some of the chive blossom vinegar. 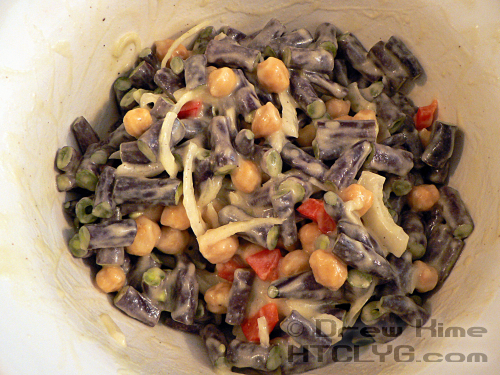 The result not only tastes great, it looks incredibly cool. Oh, and I discovered a great new take on vinaigrette along the way. 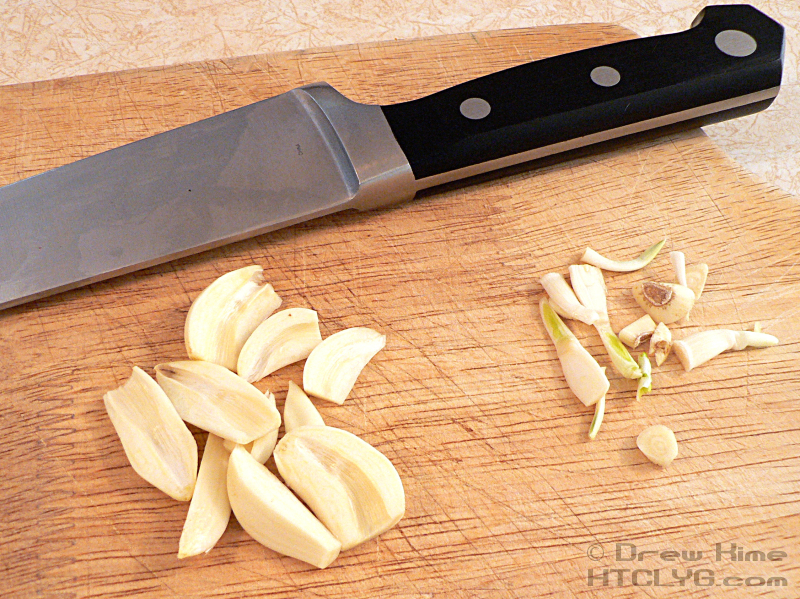 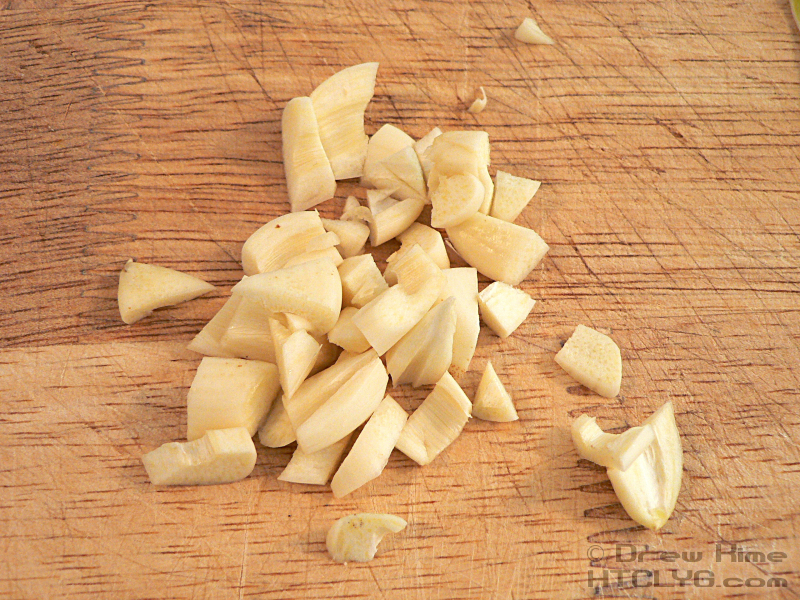 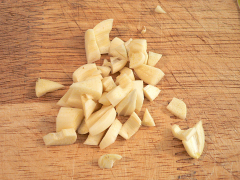 Peel the garlic, split each clove in half and remove any green stem. 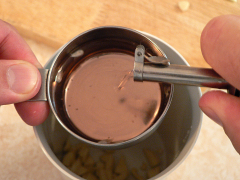 Then roughly chop the pieces and toss them into the cup for your immersion blender. But what if you don’t have an immersion blender? 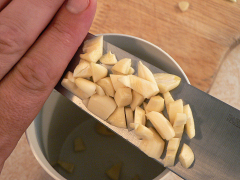 Then you’ll need to mince the garlic really fine, crush it with a mortar and pestle if you have one. 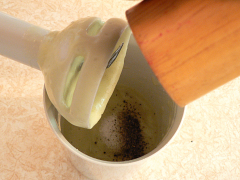 But the immersion blender is what lead to the discovery. 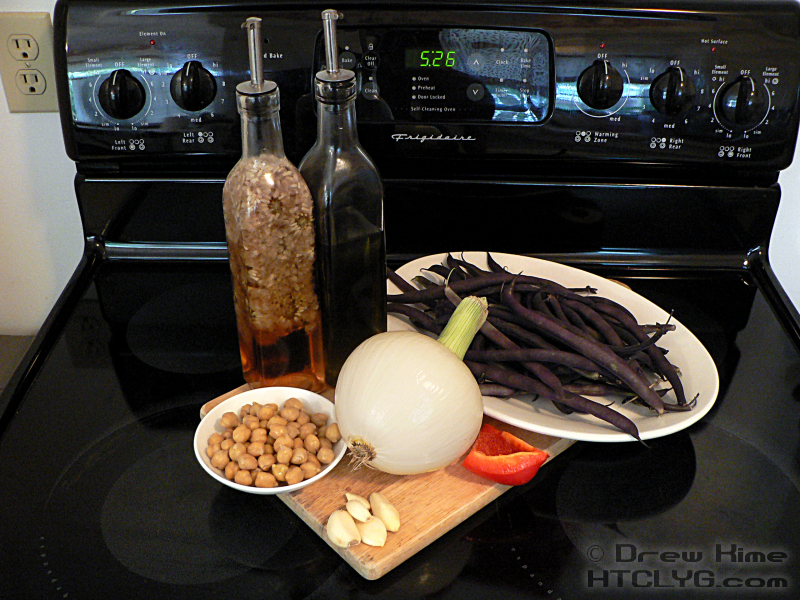 Add the vinegar and oil. 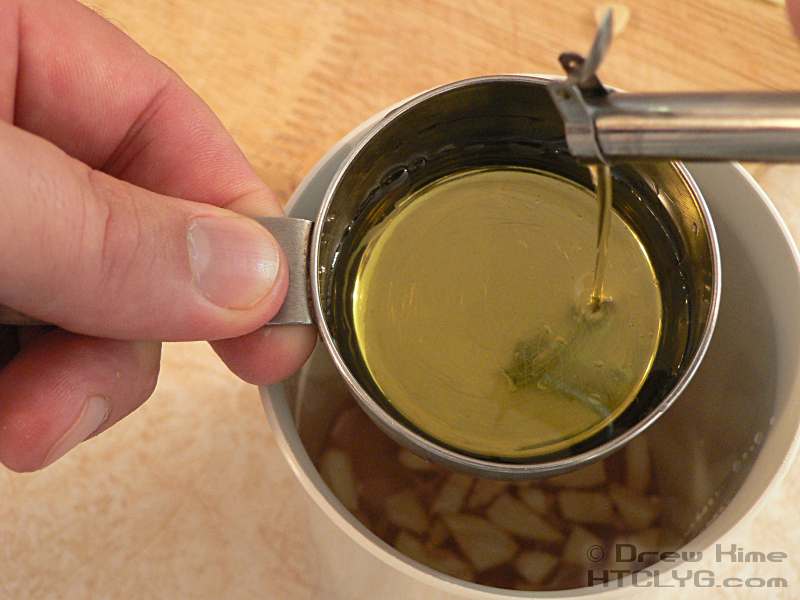 Exact amounts aren’t that important, but keep the ratio at about two parts oil to one part vinegar. Here’s the cool discovery. It took me several attempts to get the technique for making mayonnaise. 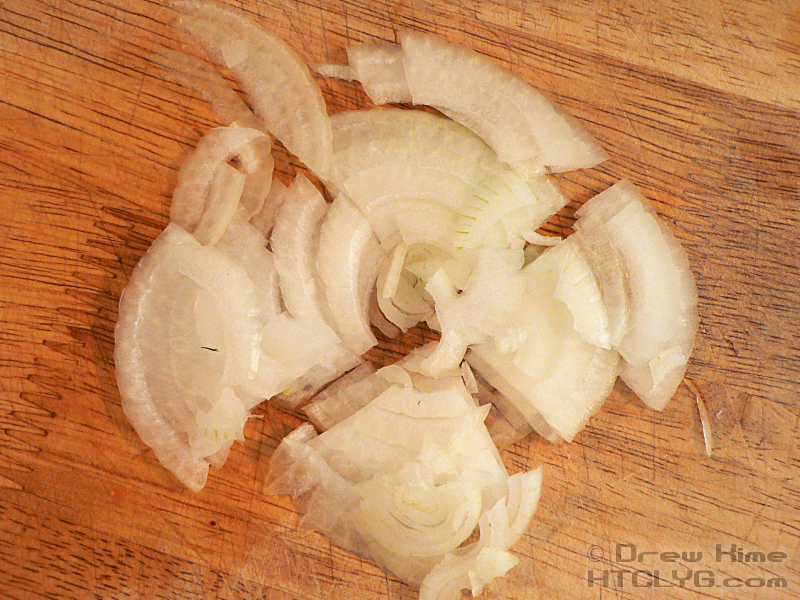 I kept breaking the emulsion. With this vinaigrette I wasn’t even trying to make an emulsion, I just wanted to chop the garlic and mix the oil and vinegar. 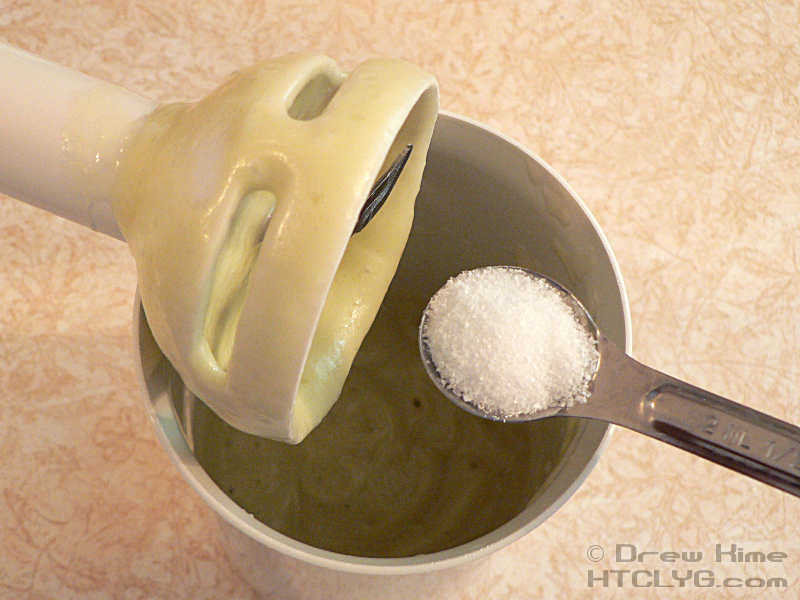 But as soon as I started to blend it, it thickened up really nicely. 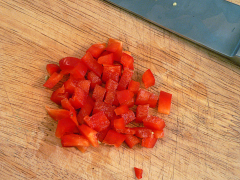 Add the salt and pepper and blend a little more to combine everything, then set it aside until you’re done with the veggies. Wash the beans and trim the ends. 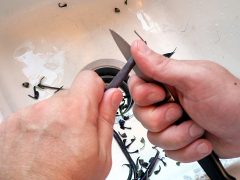 I started doing this by hand, but the knife is quicker. Cut the beans into bite-size lengths, about an inch or less. If you’ve never had them before, it’s really amazing just how purple the outside is, and how green the inside. Dice the pepper, and shave the onion very thin before cutting into short pieces. 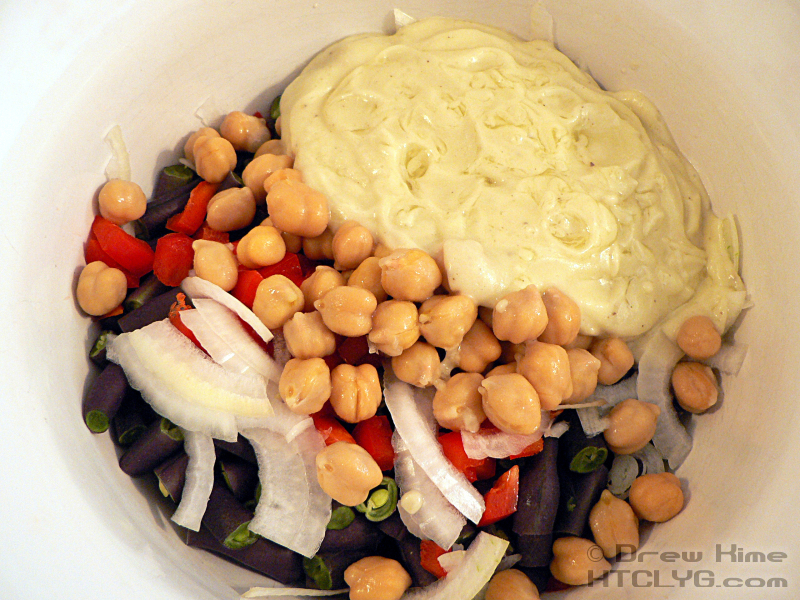 Toss the beans, pepper and onion in a mixing bowl, along with the chick peas and the vinaigrette. Mix well, and store in the refrigerator in an air-tight container at least overnight to let the dressing soak into the beans. 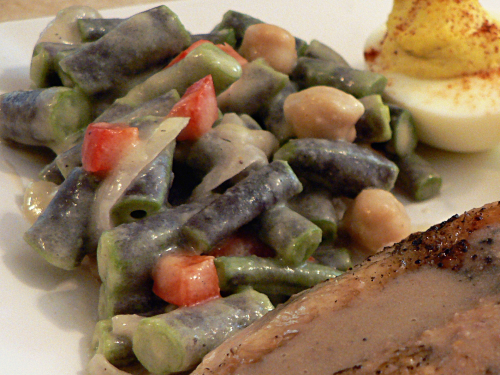 UPDATE: Up top is the shot that I didn’t put up at first, because it would give away the next day’s dish. Whoever knows what milestone is coming up and posts it here first gets a free eBook copy of my cookbook. 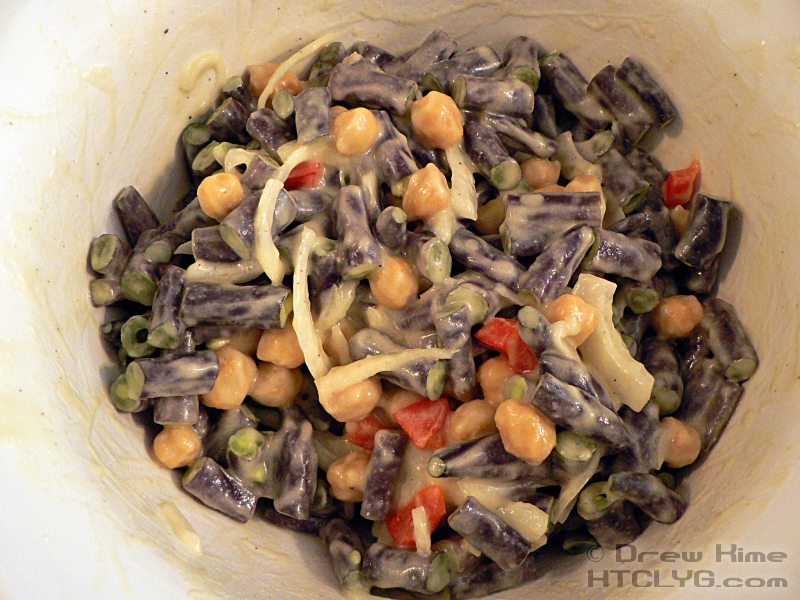 Day 5 since this was made, I’m having some leftovers for lunch. 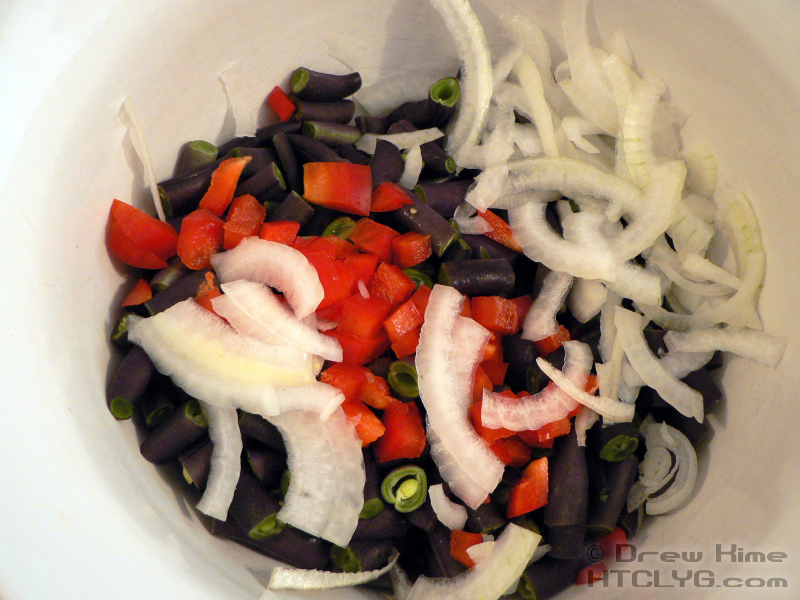 The beans are almost entirely green. The purple color has gone … into the onions! I did not see that coming. 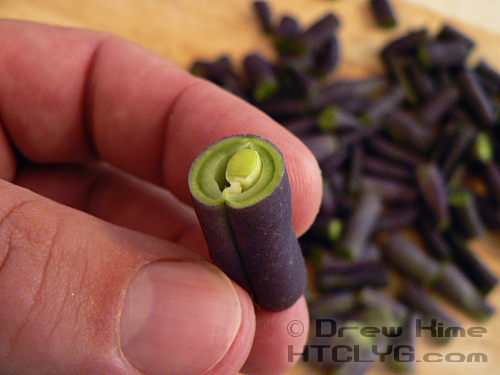 Trim the ends off the beans and cut into 1-inch pieces. 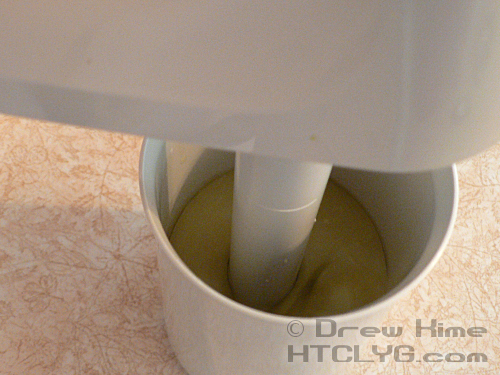 Combine all ingredients and blend with a blender, food processor or immersion blender.